Roach Control Kit B should be used in rotation with Roach Control Kit Rotation A and Roach Control Kit Rotation C to prevent bait resistance. Temprid FX must be diluted with water and applied with a pump sprayer, such as the Chapin 1 gallon pump sprayer. For Residents in NY or CT, see our New York Roach Control Kit Rotation B. Complete roach treatment includes two primary parts: Sanitation and Preparation, and the application of products. You will want to inspect for where roaches are hiding and breeding so that you know where to concentrate your energy. Next, prepare for treatment by eliminating food and water sources and reducing and sealing off harborage areas. After performing these crucial preparation steps, you are ready to apply the products in your Roach Control Kit. *To apply the Alpine Cockroach Gel Bait Rotation 2 Reservoir, remove the plastic cap from the tube you wish to use. Use the provided plastic plunger or a bait gun to dispense the gel. Behind kitchen cabinets and counter tops. In the corners up under the sink and other cabinets. In stored paper bags and boxes. Behind the medicine cabinet and vanity. in corners and under railing in and on drawers. *Do not apply bait in spots where you have used or plan to use insecticide sprays. *Smaller, more frequent bait placements are better accepted than fewer, larger placements. *Apply 10 to 20 spots per 100 square feet, using the higher rate for heavy infestations. *After application, replace the plastic cap to keep bait fresh, and store in a cool, dry place out of reach of children or pets. *Reapply bait every 2-3 weeks or when placements appear to be gone. *Roaches will die from direct consumption of the bait or from contact with roaches or feces of roaches that have consumed the bait. 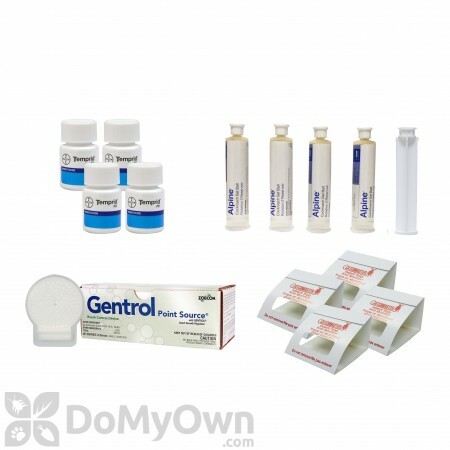 *Do not activate Gentrol Point Source Stations until you are ready to use them. To activate a station, press firmly on the pouch located on the side of the device until you hear a snap or pop to indicate the capsule has been opened. In and around kitchen or bathroom cabinets. Near refrigerators or other appliances. *Each station treats up to 75 square feet for 90 days from activation. For areas larger than 75 square feet, use multiple stations. *For convenient follow up, you can mark the month when a station has been activated with a pen directly on the station. *For vertical placements, remove the paper backing to expose the sticky surface on the back of the station and press firmly onto a clean surface. *The active ingredient will move from the station throughout the treatment area, so roaches do not have to come into direct contact with the station in order to pick up the active ingredient. *Do not apply baits, sprays, or other insecticides directly onto the stations, although these may be used in the same areas. *You will need a hand pump sprayer such as a Chapin 1 gallon pump sprayer to mix and apply Temprid FX. *Use 2 x 8mL doses (2 bottles) per gallon of water for your first application, and 1 x 8mL dose (1 bottle) for follow-up treatments, if needed. *To mix Temprid FX: Add when filling spray tank with water, or fill tank 1/3 - 1/2 with water, add Temprid FX, then finish filling the tank. Shake or agitate the mixture before spraying. *If diluted spray is stored overnight, agitate before using. Only dilute what you plan to use within 24 hours of mixing. Entry points such as around doors, windows, and water pipes. Areas where roaches travel such as baseboards and corners. Areas where roaches hide such as behind or under refrigerators, stoves, and sinks. *Do not apply on top of bait placements or where bait placements may be made. As a general rule, spray low, and bait high. *Keep pets and children out of the treatment area until the spray is dry. *Do not spray food handling surfaces or in ways in which food or utensils may be contaminated with the spray. *Reapply every 21 days as needed. *Complete roach control may take from a few weeks up to six months, depending on the size of the population and your diligence with good sanitation practices. Large populations do not appear overnight, so they will not be eliminated overnight. Separate each card along the perforated lines to create three smaller boards from each larger card. This will create a total of 12 monitors from the 4 larger cards. Fold each trap gently to create a right triangle shape. Remove the adhesive covering on the angled top tab, then firmly press the logoed panel to the adhesive, creating a secure triangle trap with three openings. Carefully remove the interior paper to expose the glue surface inside the trap. Place glue traps in areas where you have found roaches to hide, travel, or breed, such as in and under cabinets, behind toilets, under appliances, and in corners. If desired, remove the cover sheet on the bottom of each trap to expose the adhesive. Press firmly to a clean, dry surface to secure traps in place. Monitor traps weekly to check your progress. Replace traps if full of roaches, dust, or other debris. *Reapply products according to the instructions above until the roaches are eliminated. *For situations requiring treatments over several months, rotate your baits using our Roach Control Kit Rotation B and Roach Control Kit Rotation C .
It works, and works, and made me wonder how much money I have thrown away over the years and not been able to control my roach problem. I used this product last year and then again as a precaution again this year. It works, it does just what it says. Money saver! I was about to call an exterminator but I went ahead and ordered the kit. It arrived, just as described. I followed all of the directions and started using canisters for my sugar, flour, etc. I did a thorough cleaning of my house before my initial application. After the first night I noticed a difference. Most of the roaches I was seeing were dead. A couple of weeks later, my daughter came over and asked what was I using. She had noticed the difference. I am impressed! We have used Rotation A & B and are now to the point that we just need the roach bait and spray in Rotation C as we have used this weekly for two months. We had a horrible problem with roaches, couldn't get rid of them even using professionals. Within the first two weeks we saw a HUGE difference! We are two months in and have only seen maybe 5 in a 3 day time frame. We have done continual clean outs (cabinets, behind appliances, behind & under furniture even behind pictures on the walls...you'd be amazed where these little boogers will hide.) We have zero on the sticky pads, and 3 out of the 5 we saw over the weekend were deformed and looked weird. So glad we were finally able to find this product!!! I CAN'T GET OVER HOW FAST IT STARTED TO WORK, I PUT OUT THE LITTLE TRAPS, THE NEXT MORNING ONE OF THEM HAD 16 TRAPPED INSIDE ANOTHER HAD 11 IN IT. I SPRAYED THE KITCHEN AND THE BATHROOM WHERE I HAD SEEN THE HIGHEST CONCENTRATION OF BUGS AND THEY WERE DEAD ON THE FLOOR. WOW DOE'S THIS STUFF REALLY WORK. Have started seeing dead roaches. Product is working. How long do these kits last? Just wondering how often I will need to buy a kit. Also wondering if I will have to buy all three kits, or will one or two knock them out. How long Roach Control Kit Rotation B will last depends really on how bad the infestation is you are dealing with. The Temprid SC in the kit is enough to make 2-4 gallons of finished solution and can be applied every 7-10 days for heavy infestations or once every 90 days for maintanence. The Gentrol Point Source should be replaced every 4 months. The included Roach Bait Gel should be applied as needed or when it starts to become too dusty/dirty. Baits should be rotated every 3-4 months to help prevent resistance so if you are still dealing with a roach infestation after that time we would recommend rotating to the next kit, Rotation Kit C, as each kit contains a different bait. It is best to start with Rotation Kit A as the bait included has the fastest knockdown effect. Do the products in the Roach Control Kit Rotation B work on Oriental Roaches? No, the Invict Gold Roach Bait gel is only labeled for German roaches. A better option would be the Roach Control Kit Rotation A. All the products inside of it are labeled for Oriental roaches. I have two dogs in my home. Would it be safe for me to use one of your Roach Control Kits? All of the products in our Roach Control Kits are pet safe when used as directed. Pets and people do need to be kept out of the area that is being treated, but can return as soon as all surfaces are thoroughly dry. Do any of the Roach Control Kit Rotation B treatments contain peanut products? We have a family member with extreme allergy to peanut products. Roach Control Kit Rotation B contains Invict Gold Roach bait gal which is made without the eight most common food allergens for sensitive applications. The gluboards are Scent Free or non-allergenic synthetic scents. Does Roach Control Kit Rotation B come with plastic bait stations for the gel? No, neither the Roach Control Kit Rotation B nor our other Roach Control Kits come with bait stations. Bait is best applied directly to cracks and crevices using frequent, small placements. We also have a video about How to Use Roach Baits here. If you would like to purchase Bait Plate Stations separately, you can do so here.